Senchal (also spelled Senchel) is one of the eight-major cities in the province of Elsweyr, serving as the largest settlement in the region of the Quin'rawl Peninsula. Senchal is known for being an infamous, yet an influencial port-city among southern Tamriel. Filled to the brim of crowded bazaars and open-aired markets. The highly-populated harbor contains all sorts of pirates and smugglers that operate across the southern sea, and the Topal Bay. 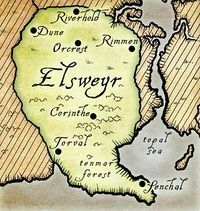 Senchal was one of the original sixteen kingdoms of Elsweyr. The city-state of Senchal is found on the eastern tip of the Quin'rawl Peninsula, as a part of the greater region of Pellitine, which consists of southern Elsweyr. Pellitine is known for jungles, rainforests, and river basins. Senchal is built on strategic grounds. It is found on the shores of the Topal Bay, where the county of Leyawiin, and the open source of the Niben River can be found, northwest of Senchal. Off the coast of Senchal are whirlpools and water eddies. The inland highways that lead into Senchal were heavily-guarded by the Third Empire, which resulted in an increase of trade in the black market through the harbor. It is possible to buy anything in Senchal, including a fresh corpse. Supposedly, the Sload of Thras would buy corpses from Senchal's black market and ship it on their airships. The air in Senchal is humid and full of chimney-smoke. There are three known districts in Senchal, the most well-known being Black Keirgo, the slums of Senchal. It is considered squalid and dangerous, with a large Moon Sugar influence. There are illegal sugar dens located throughout the streets, consisting of all sorts of people, even nobility. One location in Black Keirgo is called Sweet Street. The two other known districts are called Dagi's Pride, and Squint-Eye. Senchal is neighbored by several settlements, one of them being South Guard in the west. For the longest time in Elsweyr's history, the region was divided into sixteen sovereign kingdoms that made up the entire area and then some. They were each independent of their own and commerced with each other. One of these kingdoms was Senchal, who gained power among the realms when the twin moons (Masser and Secunda) were at syzygy, both new moons. Ultimately in 1E 2200, the Thrassian Plague had hit Elsweyr from the heart, causing the downfall of Elsweyr's sixteen kingdoms. Among them, Senchal was destroyed. The city would be absorbed into the Kingdom of Pa'alatiin, which would become modern-day Pellitine. In the waning years of the First Era, in 1E 2920, the Kingdom of Senchal was ruled by King Dro'Zel, alongside Queen Hasaama. On the 16th of Sun's Dawn, commonly known as Heart's Day, King Dro'Zel was visited by a bard from the town of Gil-Var-Delle, who recounted the ancient tale of Polydor and Eloisa. 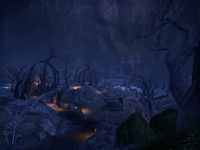 The tale had left Dro'Zel in dismay and anguish, so much so that he summoned Molag Bal to destroy the town, leaving a haunting husk of the former settlement. Sometime later by the 6th of Sun's Dusk, King Dro'Zel was named one of the new Advisors to Emperor Reman Cyrodiil III. After the Emperor was assassinated, Versidue-Shaie proclaimed the arrival of the Second Era and his new position. The only person clapping was King Dro'Zel. Years later during the Akaviri Potentate, in 2E 324, Versidue-Shaie would be assassinated in his palace at Senchal. This event was significant, not only ending the Tsaesci's reign over the Empire, but it was the earliest known record of the Morag Tong, as their name was written in Shaie's blood across the wall. Shaie would be succeeded by his son, Savirien-Chorak, who would also be assassinated, thus ending the Second Empire. In 2E 560, the Knahaten Flu was created, and it soon spread across Tamriel. The disease in Elsweyr had begun in Senchal, through Sweet Street in the Black Keirgo section. It would subsequently spread into Dagi's Pride and Squint-Eye, and eventually the town of Alabaster. Through the Alabaster ports, it would spread across Elsweyr. Senchal was heavily-affected by the Knahaten Flu. The neighborhoods were razed amidst the chaos to cure the flu in Senchal. These ruins were never rebuilt, going as far as the late Second Era. In an effort to kill off the plague, the province of Elsweyr joined the First Aldmeri Dominion in 2E 560. The alliance had sent bounties of aid and resource that would kill the disease in Elsweyr. During the early Last Seed, healers would arrive onto Senchal. As the symptoms proved to be harsh and repulsive, people had left their homes to solely find a cure. Senchal was the site of a conflict in the Tiber Wars known as the Sack of Senchal, an event that was notably omitted from Imperial history. It ended in the Empire's favor, and so General Pottreid had given the Khajiit a chance to surrender. But when they declined, the Imperial Legion continued their attack onto Senchal, slaughtering the Khajiit, adult and child alike. Attrebus of the Third Legion had slain thirty Khajiit and proudly exclaimed his feat in the battle. Eventually, Senchal was made a city of the Third Empire. The Black Keirgo section of Senchal is known as the original home of Rajhin the Footpad, the Khajiiti God of thief and tricksters. He had lived in infamy as the greatest burglar in the province's history. One of his greatest feats was stealing a tattoo off of Empress Kintyra Septim I. Rajhin's fame is attributed to the Ring of Khajiiti, an ancient relic that is hundreds of years older than Rajhin himself. During the Imperial Simulacrum in the late Third Era, the city-state of Senchal was an active settlement, being ruled by King Huskir. It had a rivalry with Alabaster. As of 3E 432, the city-state of Senchal had undergone a remarkable renaissance from being the drug capital of the Empire to a coastal resort for the wealthy of Elsweyr. This fact had overshadowed the news that Moon Sugar trade had increased multifold in the last twenty years. Senchal's uprising can be attributed to the influence of Ya'Tirrje, the Gold Cat, who is rumored to have an extravagant villa, and pay for the abundance of security in Senchal, which made the settlement crime-free. All the while, Ya'Tirrje is rumored to continue his drug-smuggling ring throughout the province. Senchal lends its name to a beverage known as Senchal Dancer Tonic.